When a clever young woman’s perfect NYC life and marriage go up in flames, what’s a nice Jewish girl to do but turn the disaster into a joke. World, meet Midge Maisel. It only takes 30 seconds into the Amazon original series, The Marvelous Mrs. Maisel before Miriam “Midge” Maisel leaps off the screen and into your heart. This is the kind of exhilarating central performance – by Rachel Brosnahan, who just picked up a Best Actress Golden Globe – made of such perfect casting as to render it impossible to imagine any other actor in the role. Her Midge is a fast-talking, expressive, flamboyant woman in love with her husband, her family, and New York City. Midge is married to Joel Maisel (Michael Zegen), a desirable Jewish catch and good provider whose hobby is doing stand-up comedy at a downtown dive club called The Gaslight. Midge is his anchor and rock, managing the children and the home with the help of her (perfectly cast) parents who live in the building, played to delicious excess by Tony Shalhoub and Marin Hinkle. She also has a genius for negotiating the ins and outs of human interactions, whether it be nabbing the rabbi for her family’s Yom Kippur or obtaining an ideal call time for her husband’s act by bribing the club’s manager with her beef brisket. All the while, Midge keeps notes. She’s a meticulous archivist, detailing the audience’s minute-by-minute response to Joel’s sets, as well as her body’s daily measurements, plus what she considers funny about the human landscape around her. Until one day when the rug is pulled from under her, with no scribbled observations that could have warned her that she was living in a fool’s paradise. Some women would collapse in tears and take to their beds. Midge grabs a bottle of Manischewitz in nothing but a nightie and an overcoat and hails a cab downtown where she literally storms the stage at none other than The Gaslight. Thus begins the adventure that will change the course of Midge’s life forever. An unlikely partnership will be forged with a somewhat androgynous woman named Susie (another perfect casting of actor Alex Borstein) who works at The Gaslight and has seen countless comics come and go, and knows real talent when she sees it. If you can’t quite place her distinctive voice, just ask fans of the animated TV series Family Guy; she plays Lois Griffin. 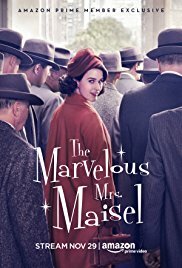 The Marvelous Mrs. Maisel may well be the second huge success by the esteemed creator/writer/producer Amy Sherman-Palladino, best known for creating the wildly popular Gilmore Girls. Indeed, this new show recently won the coveted Best Television Series – Musical or Comedy at the 75th Golden Globe Awards. It’s a rarity when everything works in a comedy series, from writing to direction, acting, soundtrack, sets and costumes and the challenge is to keep all the plates in the air spinning. In a rare show of confidence for any original series, Amazon green-lighted two seasons, which clearly indicates expectations of success. A meticulously recreated New York City of the 50s serves as both the urban set as well as the cultural touchstone behind the story. Kevin Pollak and Caroline Aaron round out the cast as Joel’s parents, giving broad comedic performances that border on slapstick, to great effect. Of course, though, it’s all about Midge and her personal and cultural awakening that is the heart and soul of the series. In a very real sense, her character can be scrutinized through the lens of social/political history, detailing a time when female comics were considered inappropriately aggressive creatures who just didn’t know ‘their place’ in decent society. And yes, when Midge takes to the stage – which clearly replaces any analyst’s couch – her honest observations about family life and womanhood often include some vulgar truths. Think Joan Rivers and Phyllis Diller and the glass ceilings they had to knock down to play with the big boys on the circuit. Rachel Brosnahan absolutely embodies Midge, capturing both the 50s gender conventions of the day as exhibited in her complacency as the dutiful and efficient wife, as well as the saucy outspokenness of an ‘over-educated’ girl whose world view is beginning to evolve thanks to a burgeoning Feminist sensibility about to erupt within the culture. Think modern-day Marjorie Morningstar, and a performance the likes of Natalie Wood would embody just as fully. Like Gilmore Girls, The Marvelous Mrs. Maisel is a show about bright, funny women who talk fast and think faster, and you’d better keep up. Here’s a trivia tidbit to show off the next time the conversation turns to this wonderful show; Rachel Brosnahan is apparently the niece of none other than handbag designer, the late Kate Spade. So there…. The Marvelous Mrs. Maisel is presently streaming on Amazon Prime.